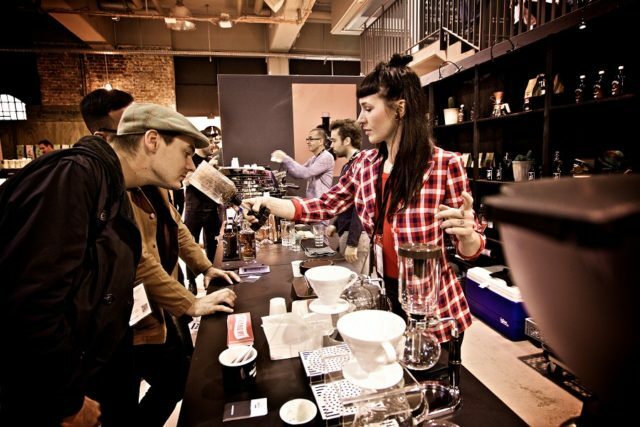 FRANKFURT A. M., Germany – Lavazza set new trends in the bar scene with its innovative drink creations at Bar Convent Berlin (8th to 10th October) and inspired visitors with exotic, floral and smoky flavours to experiment more with coffee. More than 3,000 Italian coffee specialties served, over 1,000 coffeetails and an enormous crowd of visitors at the stand once again made Bar Convent Berlin (BCB) a great success for Lavazza. A few years ago, when the company was one of the first roasters to participate in the BCB, Lavazza Martini and other coffeetails were perceived with great interest in the bar scene. In just a few years, the use of coffee in bars turned into a major trend topic, to which the organizer even dedicated its own ‘Coffee Convent’ as part of the BCB. Then as now, Lavazza is focusing on innovative approaches which hit the nerve of the times and always inspire the public anew. This year’s presentation focused on modern forms of preparation such as Cold Brew and Infused Coffee, which are particularly suitable for coffee-based drinks. Coffee has arrived in the gastronomy scene and has found its place alongside classic spirits. This year, two new sustainable products from the ¡Tierra! Range were served as the base for unusual Lavazza coffeetails and classic Italian coffee specialities. Particularly the speciality filter coffee ¡Tierra! Colombia is ideal for preparation such as Cold Brew due to its mild roasting, fruity-berry aroma notes and pronounced sweetness. The aim was to inspire the guests at the stand and at the same time set an example for sustainable enjoyment. More and more guests want exclusive products when they visit the gastronomy, which is why this topic is becoming increasingly relevant in the bar scene as well. Fumante was a special eye-catcher – not at least because of the spectacular way it was prepared. The roasting of the coffee was taken in a creative way and transferred into a drink concept. The smoking of sherry wood and coffee beans not only creates a visual, but also an aromatic experience. Combined with the infused Berry Cold Brew concentrate, the coffeetail surprised even the experienced bar scene. “This coffeetail is based on the ¡Tierra! Colombia, whose fruity notes come to the fore through an extraction with fresh wild berries in the Cold Drip Tower. Thus, omitting the bitter substances, leaving only the pure coffee taste. Combined with limes, pink grapefruit, velvety caramel and vodka, a perfect taste profile is formed that clearly points to the origins of coffee in the symbiosis with woody, earthy notes of smoke. In this way, the coffeetail includes a further taste component and is sensory perfected. A truly fascinating experience for all the senses that captivated the visitors at our stand,” says Ulrike Neiss, barista and head of the Lavazza Training Center in Frankfurt, who presented the ¡Tierra! Fumante together with the mixologist Bernardo Bernard. For lovers of pure coffee enjoyment, the stand also offered an eye catcher in form of a Slow Coffee Station, which celebrated the preparation of coffee in all its facets with Cold Drip Tower and Chemex. As a highlight, Lavazza also offered its guests the opportunity to add smart sayings to their coffee specialties which were directly conjured onto the fine milk foam. All the drinks Lavazza offered for tasting at the BCB were based on sustainably extracted coffee beans from the ¡Tierra! assortment. The product range is being continuously expanded: New is the filter coffee Lavazza ¡Tierra! Colombia, a 100% arabica filter coffee whose beans are grown in a territory formerly occupied by the FARC rebels in Colombia. Lavazza has been committed to supporting coffee producers since 2004 through the Giuseppe e Pericle Lavazza Foundation. Support is given to economic, social and ecological sustainability projects in various coffee-growing regions.